President of the HuaZong National Innovation and Modernisation Committee, Madam Tan Tat Chin stated that 20% of the elderly were abandoned by their children. According to Madam Tan the main cause of these incidents were because elderly parents had no money to care for themselves after spending everything on their children. In such cases, the elderly parents – due to familial ties and affection for their children – typically pay for their children’s’ gambling debts. Some even hand over all they possessions only to be abandoned by their children. As such, Madam Tan believes that we should make plans for ourselves – not just for our children – and it is important to plan for your life during retirement. 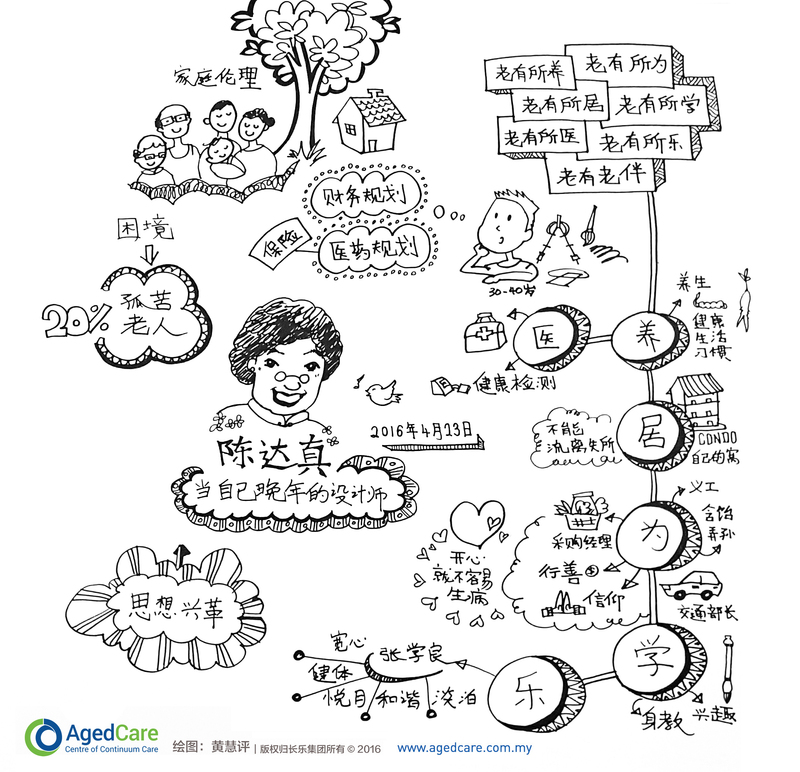 In an effort to address the issue, Aged Care Group together with the HuaZong National Innovation and Modernisation Committee and the Federation of Hokkien Associations Malaysia co-organised a Retirement Planning Talk for the Chinese community. Madam Tan presented on the topic of designing one’s own lifestyle in old age – entitled “Be My Own Old Aged Designer” – while Fong Mun Toh – speaking on behalf of Aged Care Group and an associate of Managedcare Sdn Bhd – spoke on the current retirement planning situation of the Malaysian elderly. More than 200 people – ranging from the elderly to young adults – attended the morning talk on Saturday, 23rd April 2016. Additionally, she encourages the elderly to make contributions to society, their families and to themselves. They could volunteer themselves for social causes, cook a meal for their family and attend talks or pursue a religious life for their personal growth. On the topic of finances, she stated that with people’s average life expectancy increasing to 80 or 90 years old, it even more important now to do financial and medical planning. She advises people to take precautions, such as obtaining a medical insurance to protect themselves from expensive medical fees. She also stated that people should learn and gain knowledge about healthy living while they are young as chances of getting hypertension, high blood sugar and high blood cholesterol is very high as one ages. Madam Tan stated that a lot of children eventually have to send their aged parents to old folk’s homes. Hence, to avoid from becoming a displaced person she advices elderly people to seek their own places to live on their own terms. She also stated that elderly people be active in social engagements by communicating with their children or grandchildren and participating in social activities like dancing and singing to create positive emotions. Madam Tan stated “the elderly should not spend their time watching TV but find ways to exercise their brain to decrease chances of suffering from Dementia”. She stated that we should instead “cultivate a lifelong interest – while we are young – that will continue to retain our interest as we age such as calligraphy, drawing, gardening or playing music”. She also encourages the elderly to surf the net to keep themselves current or read books to gain knowledge, stating that doing so will keep them mentally stable and emotionally edified. She concluded with a message that you have to save money for yourself and to better plan your retirement early when you are still in your 30s or 40s to ensure you age in dignity. People need enough funds for their care in old age and the cost of staying in a day car centre’s single room would incur an estimated monthly fee of RM4000, amounting to RM48 000 a year. Mun Toh stated the current challenges facing elderly care in Malaysia are due to the rising costs of healthcare, unpreparedness for potential life crisis, lack of financial planning and no support from the family or authorities. As such, he encourages people to make financial plans for their long-term care as early as they can for both themselves and their loved ones. To address the issue, Mun Toh recommended CareTRUST™ – a living trust where you can set money aside to ensure provision of continuum care that is financially sustainable – as part of their retirement planning. He stated that CareTRUST™ account holders can rest assured Rockwills Trustee will safeguard their interests and that their money will be invested in a cash management solution offered by KenWealth. Their money will be monitored and disbursed for their care according to the account holder’s instruction. 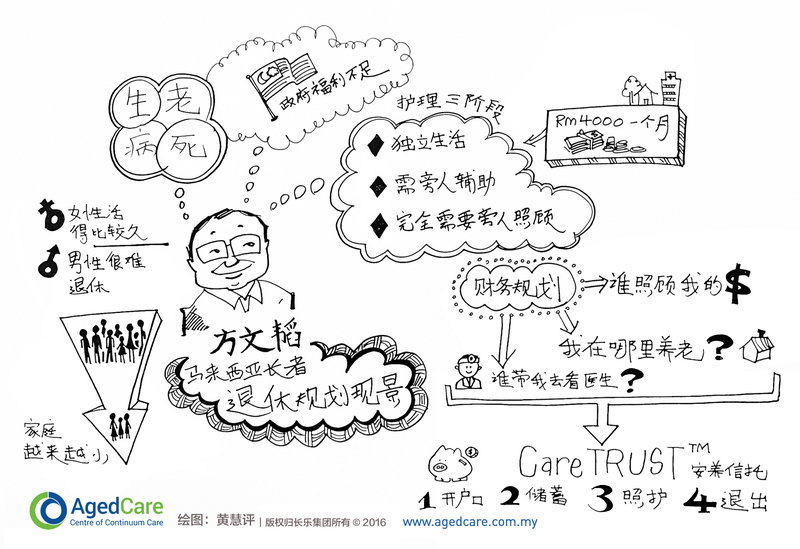 He explained that when a CareTRUST™ account holder is in need of care, Managedcare will assign a Care Manager to conduct a care assessment on the client and develop a care plan. The Care Manager will then identify, assess suitability of services and engage the care providers to administer the necessary health & long-term care services. This entry was posted in News and tagged Fong Mun Toh, HuaZong National Innovation and Modernisation Committee, Madam Tan Tat Chin, Retirement Planning.